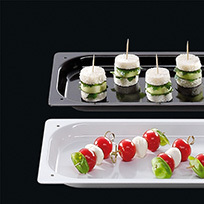 The new BLANCO Buffet Line for appetising food presentation. Easy cleaning due to the extremely smooth surface. Suitable for use in combination steamers thanks to high temperature resistance. Up to 50% lighter than their Peers made of porcelain. Minimal supplementary purchasing costs due to low risk of breakage. Particularly colour-fast surface, still attractive after many uses. Simple insertion into shelf trolleys or tray racks due to thinner material. With the new BLANCO Buffet Line, you can optimise your workflow while also saving valuable time. This is because with BLANCO Buffet Line you can store food in a single container, regenerate it in a combination steamer, transport and present it – without transferring any food. Minimum order of 1 item, available directly from stock, with an extremely short delivery time and in proven BLANCO quality, guaranteed "made in Germany".